Just been following up on an invitation to join a British Computer Society meeting to be held in Second Life at Bangor University (UK). I'm horrified to see that it is nearly 3 years since I updated my blog (time flies when you're having fun!) 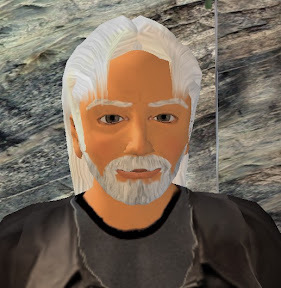 and nearly as long since I was in Second Life. Well, the BCS meeting is tonight - so it will be interesting to see whether or not the BCS / Bangor Uni are miles behind the technology curve in their uptake of SL, or if the technology has matured enough to be really useful.... or if the technology is SO mature as to be completely decrepit and past it! I really do still exist! First of all, the SL client now seems to work OK on my company Laptop (an HP Compaq nc6400) Now this could be because I have a newer laptop than previously, OR (more likely) that the software has become a lot more stable. Despite this, I haven't found enough time whilst working away to use hotel internet connections to get into SL (sorry!). Secondly, the Google "Lively" environment has arrived on the scene. I tried running it last night.... conclusion: well, it works, though in some ways it is not really as intuitive as SL. I haven't tried playing with it "in anger" yet - I really must find a "room" with some people in to chat to. Meanwhile my chum Aleister Kronos has continued to blog SL at the rate of an entry a day.... he really ought to look into hosting advertising space on his blog - I'm sure he'd make some money on it! So that's it for now.... you never know, I might get back to post a new entry in the near future! Yay! SLeek is now working again so I can chat to my friends in SL!!! Congratulations and thanks to Delta Czukor (Paul Clement) for updating the code. Thanks must also go to the Best Western hotel Dauphitel (Grenoble, France) who are providing me with internet access tonight! Still, with reasonable internet access and a working SLeek, I'll have to see if I can come up with some more interesting blog entries than this drivel! Well, Linden Labs make the SL interface "open" so that anyone could write their own UI. Three Cheers for that. So we have a 3rd party interface (SLeek to name but one)... Yippeeee I can now access SL from my work laptop when I am stuck in a hotel room away from my shiny turbo nutter ba*&%$d PC with decent graphics card sitting at home un-used. NOT!! Just as I thought I'd got my SL withdrawal symptoms fixed (a night in a hotel room with my company laptop, SLeek, and a free wifi internet access) I find (not for the first time) that SLeek has been broken by changes to the SL interface. So much for an "open" interface.... it may be open and freely published, but it sort of defeats the object if every new version of SL goes and breaks the interface (or 3rd party clients). Sorry.... I'm probably suffering from a hefty dose of cynicism and a couple too many beers and glasses of wine!... but it is certainly a pain that I can't get into SL from my non-graphics PC. What adds insult to injury is that the web interface via Katharine Berry's server doesn't seem to work via the hotel wifi connection either DOH! Gosh - over a month since my last blog entry..... I really must do something about my (lack of) blogging. To explain; since the start of April I've been working 3-4 days a week away from home, so have not had the opportunity to go into SL and "play". (for some strange reason my wife does not see exploring SL as a priority activity..... in fact she does not see ANY use of the computer as a priority activity... so when I do get home I don't have time to spend in SL). But enough of my home life. An enterprising young lady (well, I say young lady... it could be an old man for all I know) called katharine berry has developed a web interface to SL. Always liking new toys, I had a play with it earlier this evening. I'm pleased to report that the interface works! It took me a while to come to this conclusion, as no-one I knew was logged onto SL this evening!! However, once some of my friends came on line, I was able to send them IM's & the system seems to work. The interface allows you to Chat, IM, view the map and teleport (though to teleport, you really need to know the coordinates of your destination to do the job properly). My only complaint (compared with SLeek) is that the interface does not let you send an IM to someone who is not on-line. There have been questions raised about the security of entering SL username and password into a third-party web site, but I guess this is one occasion where you just have to trust the site designer (Katherine claims to encrypt username and password, and promises not to store them). So if, like me, you need to access SL from a machine that does not support the necessary graphics, you might like to give ajaxlife a whirl!